Change is difficult. It takes a lot for someone to look at a set of drawings, understand the plans, and see the vision for a future childcare design. 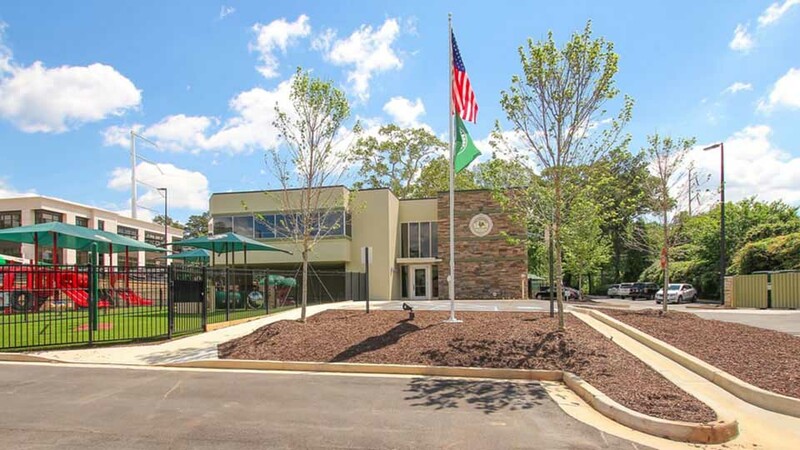 To deliver an urban childcare design solution in an under served market in Sandy Springs, GA, an existing office building was selected that was part of a 4-lot mixed-use planned urban development (PUD) by Halpern Enterprises. It took a vision for what could be and patience to see the project through to fruition. Prior to re-zoning, the land had been occupied by two run-down homes being used as offices, a 2-story commercial office building being used as a synagogue, and some overgrown green space. As soon as construction began, the two houses were demolished. In their place, an office for Halpern Enterprises was established and a shared parking lot was paved. 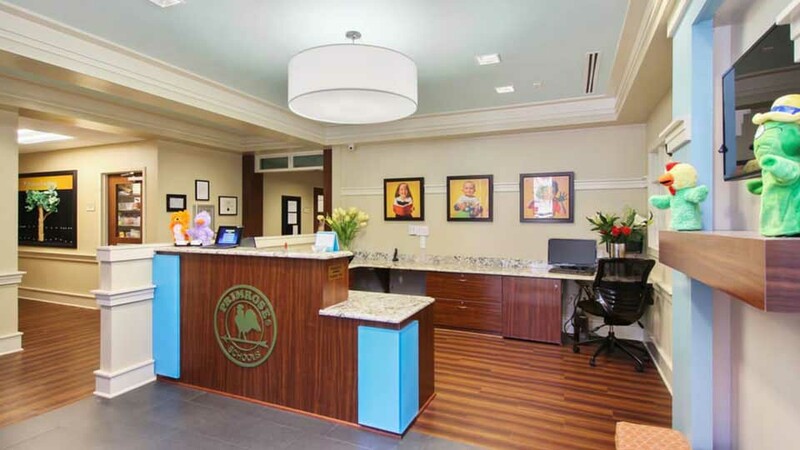 The commercial office building was remodeled into a childcare center and the undeveloped green space was developed into single family town homes. 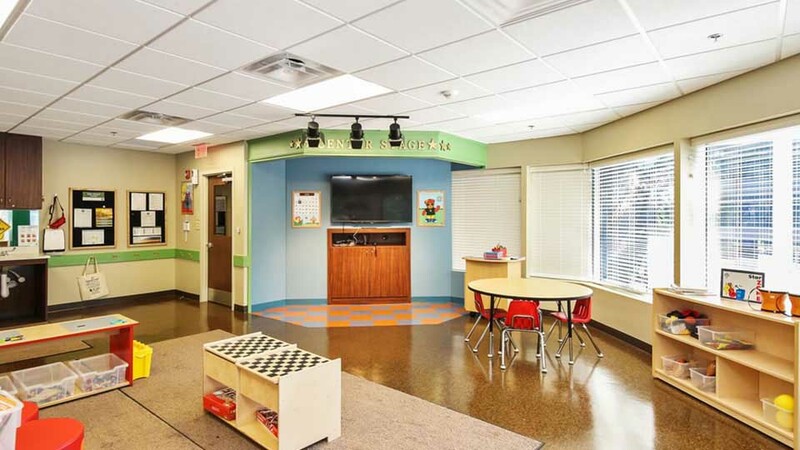 Since the property is located along a heavy commuter road and the entrance is not facing the street, branding and signage were extremely important components to the exterior urban childcare design. There was a specific need to attract and guide families unfamiliar with the location to the building. Once there, families are welcomed by a beautiful stone veneer entryway that leads to an open 2-story reception area. 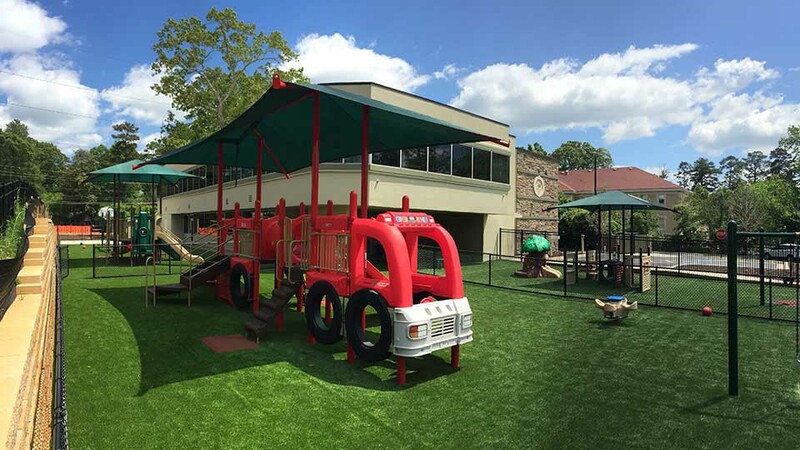 Thanks to the shared parking available from the neighboring offices, we were able to convert most of the existing parking lot into playground space. 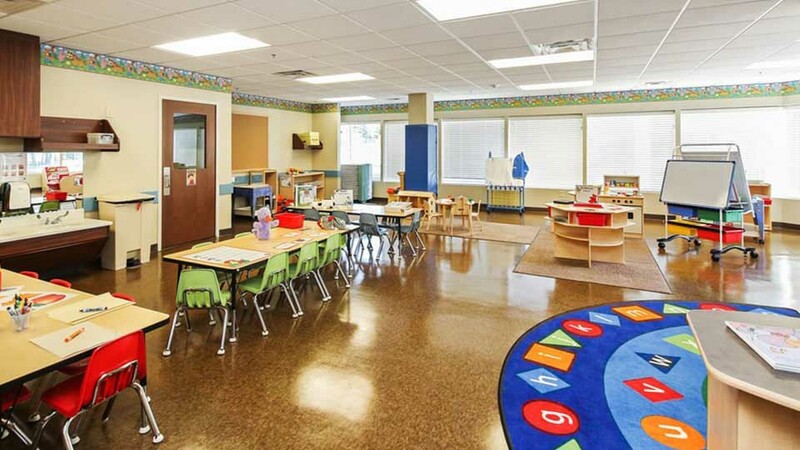 The flat areas of play create a spacious extension of the classroom, while the retaining wall offers protection from the elements as well as a sound barrier. The three types of building uses living side by side is a classic example of good land stewardship for the community. Each building is relying on the other for mutual support. During construction you could get a sense of what was happening, but it wasn’t until it came to fruition and you see the actual community living, working, and playing together that you realize the true vision. To see another urban infill childcare design, visit our Primrose of Upper Kirby project. Total Area: 14,600 sq. ft.